Will Jerry Brown Find 'Common Ground' With Trump on Building Delta Tunnels? California Governor Jerry Brown issued a statement last week on the 2016 presidential election and the transition to the new Trump administration in the wake of one of the nastiest, most vitriolic and most bizarre presidential elections in U.S. history. He said his administration would do its part “to find common ground whenever possible” while “protecting the precious rights of our people” and confronting “devastating climate change. Brown stated, “Today we saw the beginning of the transfer of power to the President-elect. While the prerogatives of victory are clear, so also are the responsibilities to ensure a strong and unified America. As President Lincoln said, ‘A house divided against itself cannot stand.’ With the deep divisions in our country, it is incumbent on all of us – especially the new leadership in Washington – to take steps that heal those divisions, not deepen them. In California, we will do our part to find common ground whenever possible. But as Californians, we will also stay true to our basic principles. We will protect the precious rights of our people and continue to confront the existential threat of our time – devastating climate change. While I strongly support his call to protect people’s rights and to confront climate change, I fear that these are hollow words and he may in fact make a deal with incoming President Trump to support his “legacy project,” the environmentally destructive Delta Tunnels plan, the construction of new dams and the expansion of fracking in California. While Brown poses as a “climate leader” and “environmentalist” at climate conferences, he is heavily backed by agribusiness billionaires and the oil companies — the same corporate interests that have funded Brown’s reelection and proposition campaigns, including Proposition 1 in 2014. These are the same corporate interests that Trump and his transition team represent. I fear that the “common ground” that the Brown administration will find with the Trump administration will be on tunnels, new dams and fracking. We must stop Brown from working with Trump to weaken landmark laws like the Endangered Species Act and Clean Water Act in order to fast-track the completion of the California Water Fix before he leaves office. Trump hasn't taken a specific position on the Delta Tunnels, but his comments to date on California water have shown a strong embrace of the campaign by corporate agribusiness interests to pump more water from the Delta at the expense of Delta smelt and salmon populations. At a rally at the Selland Arena in Fresno on May 27, 2016, he appeared to agree with the claims of some growers that there is no drought in California. He also claimed that the subsidized water that growers should have received was washed out to sea in an effort to protect “a certain kind of 3-inch fish," referring to the Delta smelt . “Believe me, we’re going to start opening up the water so that you can have your farmers survive,” said Trump. Politico also reported Wednesday that David Bernhardt, a lawyer who co-chaired the natural resources department at the firm Brownstein Hyatt Farber Schreck and served as a George W. Bush Interior Department official, is leading the transition's Interior Department team. Big Ag’s Nunes appointed to Trump transition team! It gets worse. Today Representative Devin Nunes (CA-22), one of the most aggressive Congressional proponents of increasing Delta water exports to agribusiness, joined the executive committee of Donald Trump’s transition team. 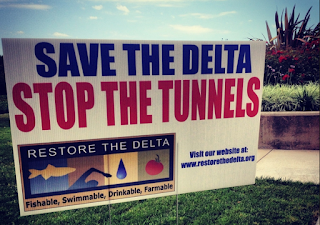 Jerry Brown’s Delta Tunnels/California Water Fix plan poses a huge threat to the ecosystems of the Sacramento, San Joaquin, Klamath and Trinity river systems. The project is based on the untenable premise that taking more water out of a river before it reaches the estuary will somehow “restore” the San Francisco Bay Delta and its precious fish and wildlife species. This project, featuring two massive 35 mile long tunnels under the Delta, will make the Sacramento-San Joaquin River Delta, San Francisco Bay and our ocean waters into a giant aquatic graveyard. We must drive a stake into the heart of this project and stop it from pushing Delta and longfin smelt, Central Valley steelhead, Sacramento River winter-run Chinook salmon, green sturgeon and other fish and wildlife species into extinction — and prevent Brown and his administration from making any deals with the Trump that will weaken landmark environmental laws to push forward the tunnels, as well as new dams and fracking. The California WaterFix is not the only environmentally devastating policy promoted by Governor Brown. Brown is promoting the expansion of fracking and extreme oil extraction methods in California and is overseeing water policies that are driving winter run-Chinook salmon, Delta and longfin smelt and other species closer and closer to extinction. The California Fair Political Practices Commission (FPPC) in September opened an investigation into the California Democratic Party in response to a report by a prominent consumer group, Consumer Watchdog, claiming that the party acted as a “laundry machine” to funnel donations from oil, energy and utility companies to Brown’s 2014 election campaign. The report, “Brown's Dirty Hands, tabulated donations totaling $9.8 million dollars to Jerry Brown’s campaigns, causes, and initiatives, and to the California Democratic Party since he ran for Governor from 26 energy companies with business before the state. The companies included the state’s three major investor-owned utilities, as well as Occidental, Chevron, and NRG.